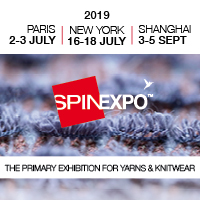 Family-run Italian hosiery knitting machine builder Busi Giovanni presents its complete range of machines capable of knitting certified-compression medical socks. The company announced extending its portfolio in September 2017, with the introduction of a 5-inch diameter to the previously existing ones of 4" and 4.5". “Our complete range of machines for medical (certified compression) socks is available in 4", 4,5" and 5" diameters, capable of covering approximately 90% of the required sizes and producing items in compliance with the international medical classes 1, 2 and 3,” said Michele Castagna, Export and Marketing Manager. The available versions include Busi Medical and Busi Medical Terry machines, equipped with two feeds for the main yarns, plus two more feeds for elastic ones. Sandwich terry and selected terry options are available on the Terry version only. The machines are provided with two knitting feeds for both plain stitch and true rib. The compression graduation is achieved by using the automatic stiffening, which is available on all the stitch motors and by graduating the tension of the inlaid elastic yarn. All of these versions are available equipped with the company’s Rimaglio automatic, stitch-by-stitch, toe-closing device, even up to the highest possible gauges. It downloads the sock from the machine, after completion of the knitting operation, and it transfers the sock to the linking device, where it is sewn loop by loop. The sock is turned inside out, so that the linking remains on the inside of the sock, resulting in a perfect traditional-looking linking. After being sewn, the sock, already reversed to the right side, is removed from the machine and is ready for the next boarding operation. Since 1958 Busi Giovanni has specialised in the design and construction of single-cylinder machines with rib needles in the dial for the production of high-quality stockings, socks and tights. The company is a supplier to the most important producers of stockings, socks and tights, for the men's, women's and children's markets - classic, patterned, sports, technical-sports, as well as medical, with special solutions for graduated compression. The family-run company sells in 63 countries around the world (90% export) through a network of partners that provide distribution and service. With 61 years in the business, Busi manufactured 8,066 machines so far.